The Symphony No. 1 in G minor Winter Dreams, constitutes Tchaikovsky’s first major composition as a professional composer. He was twenty-six at the time and the year was 1866. He had just accepted a professorship at the Moscow Conservatory. The work had a lengthy gestation and was revised several times, the third and final revision being in 1874. It was dedicated to his teacher and mentor Nicolai Rubinstein, who conducted the first performance of the complete work in 1868. Individual movements (II and III) had been performed earlier in 1866 and 1867. The work cost him dear in terms of his health. Working frantically day and night in a burst of creative energy, he suffered insomnia and hallucinations. His doctor considered him to be on the brink of a complete mental breakdown, but he managed to take stock and rein himself in somewhat, making the conscious decision never again to work during the night. The symphony has echoes of Mendelssohn, especially in the third movement, and folk elements pervade the score. He himself chose the title Winter Dreams; he also furnished the first two movements with titles: Dreams of a winter journey and Desolate gloom, land of mists respectively. For the Scherzo, the composer recycled a movement from an early piano sonata, and to this he added a luscious waltz. Whether he later regarded this symphony as a youthful indiscretion is a moot point. He would certainly declare that ‘despite all its glaring deficiencies, I have a soft spot for it, for it is a sin of my sweet youth’. 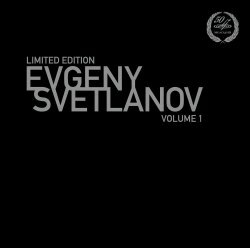 Very welcome indeed for vinyl enthusiasts, like myself, is this ‘Limited Edition’ entitled ‘Evgeny Svetlanov - Volume 1’. It begs the question as to whether the rest of the cycle will follow. Svetlanov recorded the complete Tchaikowsky Symphony cycle twice: first in the studio for Melodiya in 1967, from which the recording under discussion was taken, and later live in Tokyo with the same orchestra in the 1990s. This second traversal has appeared in CD format on the Canyon Classics and Exton labels at extortionate prices, and on Warner Classics. I have always held in high regard Svetlanov’s early Melodiya Tchaikovsky set. Objective in his approach, he eschews the overly romanticized and inordinately emotional thrust of some conductors. The performance here is gripping, eloquent and poetic. The emotion is suitably reined in, and tempi seem just right. I compared the sound of the LP with the CD version that I have (Scribendum SC 024). The CD I found over-bright in comparison, which I hadn’t been aware of previously. The Melodiya LP has a more rich and spacious sound, with more bass and slightly less top, offering a more natural perspective of depth and ambience. The string sound is richer and warmer. The woodwinds are delineated with a diaphanous aura, and the brass emerges with a burnished intensity. I did not detect any imperfections in my LP copy, which was noiseless, with silent surfaces. Neither could I perceive any master-tape hiss or any evidence of pre-echo at the beginning of tracks. When the volume was turned up, there was no overload distortion in the loud passages. In fact, the entire aural image is forward, bright and free from distortion. Middle frequencies are well-defined as are both the upper and lower end of the frequencies. The LP is housed in a superb, sturdy, state-of-the-art black cover with magnetic fasteners. Track-listing with individual movement timings, on the reverse, are in Russian and English and, surprisingly, constitute the only documentation. I looked for a booklet inside, but there was none. One can only look forward in anticipation to volume 2. This LP constitutes a good investment for vinyl enthusiasts.